Home › Get A Gift For Being VIP! Get A Gift For Being VIP! Coming February 6th, 2017 to all active VIPs! 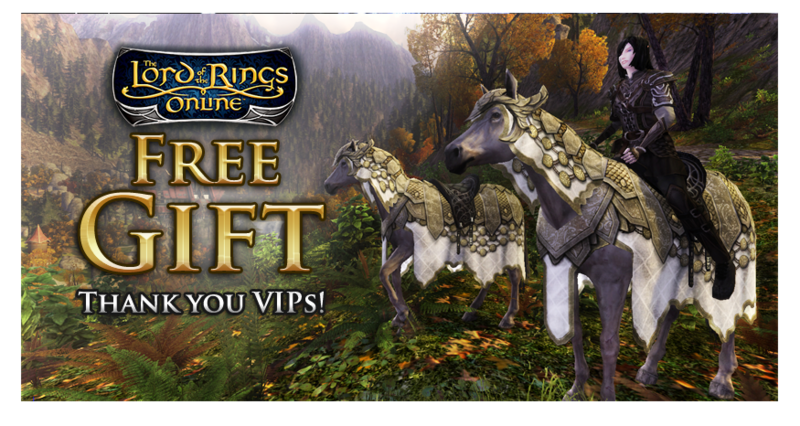 As a thank you from Standing Stone Games, starting February 6th, active VIPs can receive a special gift! Simply sign in and log into a character on your VIP account before March 19th to get an Account-wide Steed of the Eldar for all your characters, forever! Not a VIP yet? Sign up between February 6th and March 19th and you are eligible for the gift too! • Gives +68% speed and 250 morale! • Includes a War-steed Caparison, Saddle, and Halter! • A mount for all your characters now, and all future ones too! If you are an active VIP, simply log in between February 6th and March 13th to receive your gift. You must log into one of your characters on at least one server to receive the gift. Note: If you sign up for VIP after you've already logged in, you may need to logout and back in before your gift starts to appear on your characters. Not a VIP yet? No problem! Sign up before March 19th and you are eligible to receive the gifts too! If I don't log into my character, but am VIP, will I still receive my gifts? You must log into the game between Feb 6th and March 19th, and into your character, to receive your gifts. Do I need to log all the way into my character, or can I just log into the Character Selection screen? You must log all the way into your character on at least one server in order to receive the gifts. Do I have to log in all my characters? No, as long as you log into at least one character on one sever between Feb 6th and March 19th, your account will receive gifts on all your current and future characters forever from that point on. Where will I receive my gift? If you already have the riding trait, your gift will automatically appear in your Skills Mounts Panel and your War-steed cosmetics will automatically appear in your Mounted Combat Appearance Panel. If you do not yet have the riding trait, your gift will appear in your character’s inventory, and can be activated once you obtain the riding trait. All characters on your account will receive the Steed of the Eldar when they log in, as well as all future character you create on your account. If I log in after March 19, will I still receive gifts? Only VIPs who log into one of their characters between February 6th and March 13th will have their accounts flagged to receive the gifts on all their current and future characters. If I’m a Lifetime VIP, do I still get the gift? Yes. We value all our VIPs, including our Lifetimers. All Lifetime VIPs will also receive the gift, but you must log into your character between Feb 6th and March 19th to receive it. Help! I logged in, then I signed up for VIP, but I don't see my gift! What happened? Remember that the gift delivery begins February 6th, and if you were already logged into your character when you signed up for VIP, you may need to logout of the game then log back into the character before the change to your account activates. If I'm already an active VIP, do I still get the gift, or is this gift only for new VIPs? All our active and new VIPs will receive the gift if they log into their character between Feb 6th and March 19th. Thanks for being a VIP, and welcome all new VIPs! When can I use my Mount and War-steed Cosmetics? Your travel mount can be used as soon as your character has the Riding Trait. The War-steed appearances can be used once you have acquired your War-steed in Rohan. Will this apply to all servers? Yes, your Steed of the Eldar will be available on all servers.